Easily grown in average, medium, well-drained soil in full sun to part shade. Adaptable plant that tolerates wet conditions and wind (including sheltered seashore areas), drought and a wide range of soils (prefers sandy, acidic loams, but tolerates poor soils). Does not transplant well. Once established, however, it can spread rapidly to form colonies. Comptonia peregrina, commonly called sweetfern, is an upright, deciduous shrub (typically growing 2-4' tall) which features simple, narrow, lustrous, pinnatifid, deeply notched, olive to dark green leaves (to 4" long). Insignificant, yellowish green flowers appear in spring and give way to greenish brown, burr-like nutlets. A native shrub of eastern North America which most often occurs in poor, sandy or gravelly, infertile soils, such as along roadsides. Fixes its own nitrogen. Genus name honors Henry Compton (1632-1713), Bishop of London, dendrologist and patron of botany. Specific epithet means exotic or immigrant. 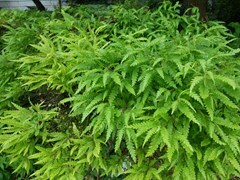 Foliage is aromatic and resembles that of ferns, hence the common name of sweetfern. No significant insect or disease pests. A good shrub for areas with poor soils, such as along alleys, waste areas or roads. An interesting and vigorous plant for native plant gardens or naturalized areas where it can be left alone to colonize. Also a good plant for stabilizing slopes or embankments.